Saskatchewan Gold starts with an "M"
Prairie gold: Mustard from the heart of the province. Established in 2008, Gravelbourg Mustard has taken the Canadian market by storm. Locally owned and operated, Gravelbourg Mustard produces the finest gourmet mustard products in Saskatchewan. 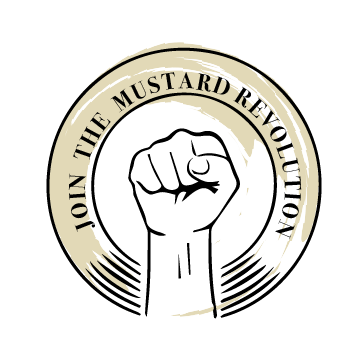 Specializing in European style mustards, our popular line of gourmet products is continually expanding to include nine flavours of mustard, dry rub, dressings and dry mustard and mustard seeds. With a passion for food and making every day a little more gourmet, we are always looking for new ways to show you how to use our mustard - like the Cranberry Mustard Martini we created for the Dragon's on the Dragon's Den in late 2017. Ready to get wild with mustard? Gravelbourg Mustard is produced in Canada with the highest quality ingredients and in officially gluten free. Today, 75-80% of Canadian mustard is grown in Saskatchewan and 40-50% of mustard in the world is produced in this golden province. Gravelbourg Mustard strives to showcase the excellence of the prairies with a diverse line of European style mustards from seeds grown right at home. Our popular products come in a variety of flavours and textures creating a unique line including: German Style, French Style, Saskatoon Berry Style, Cranberry Style, Garlic Style, Cajun Style, Honey Dill Style, Jalapeño Style, and Beer Style. In addition, we carry dressings, dry rubs, dry mustards, dry rub, and dry mustard.